Karen, John, Jay & Mitchell welcome you to their 25 acre family run mango farm to enjoy the location and of course the food. to Australia 10 years ago. John hails from Albany in WA and worked as a butcher before heading North and retraining as a Boilermaker. 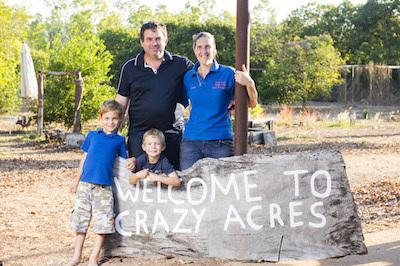 Expanding every year, the Crazy Acres journey started back in 2008 when we moved from Kununurra 7 months pregnant with our first child. Having never farmed mangoes before and staring at 1400 of them we had to jump in with both feet. John picked the first harvest on his own and they were packed by a packing house for market while Jay was welcomed into the Crazy Acres family. The following April saw us start the Farm Shop and we sold a full range of Australian fruit and veg and later included a delivery service to workplaces in town. All with a small child sitting under the shop counter. By the 3rd year of the shop we had added the homemade ice cream which we started making in a small machine that could churn out 7 portions in around 30 minutes. 3 of those machines and working through the night got us started on our journey into the ice cream world! Approaching the GM of the Deckchair Cinema in Darwin was the best thing we could’ve done as they welcomed us in with open arms and we’ve never looked back. 2010 saw Mitchell being born in to the Crazy Acres family in the middle of the Dry season and at 3 days old was on his first ice cream delivery with mum, before taking pride of place on the shop counter in an apple box. He became the star attraction and featured on many a blog of travellers from around the country as the “baby in the box”. 2013 we took the big decision to change direction and leave the fruit & veg to the supermarkets while we went ahead and got a restaurant permit, built a purpose built kitchen and committed to a commercial ice cream machine and blast freezer. This new equipment saw us go from churning 21 portions an hour through the night to 25 portions in under 5 minutes. Karen didn’t know herself!!! It took one season to outgrow the café kitchen so we built another one! This left us able to expand the menu and it meant with a dedicated ice cream kitchen, we didn’t have to work through the night to make ice cream after the café was shut. Every year after the farm closes to the public at the end of the Dry season, it’s time for the really hard work to begin. The whole family gets involved in mango season. We currently have 1100 Kensington Pride and 300 of the Nam Doc Mai variety, which are the Asian variety, most commonly used green in salads etc. 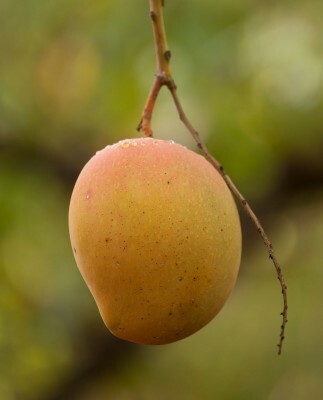 Kensington Pride are one of the most popular varieties and these are the ones you eat in the bath tub or over the sink with the juice dripping from your elbow. 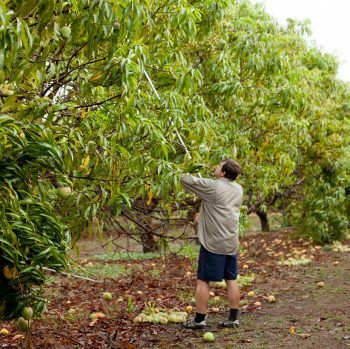 We still harvest the mangoes ourselves but we have a few backpackers to help and they are all kept in line by Jay the farm manager. For the last couple of years nothing has gone to market. Everything we have picked, we have processed (by hand of course). The cheeks are cut from the fruit and scooped out of their skins before heading to the freezer in bulk for the ice cream and preserves etc, or in tubs for you to buy. A large quantity is also sliced (by hand) for dehydrating which takes around 12-14 hours to dry. The Crazy Acres family aren’t afraid of hard work and we are looking for more things to bring you every year. We have a range of homemade preserves which we have consistently won prizes with at the show and we pride ourselves in bringing you everything homemade with our Farmers loaf also being a prize winner. We are happy to see so many of our customers return year after year and we hope you enjoy seeing our family and business grow up as much as we do. Not being the kind of people to sit around, we jumped at the opportunity at the end of 2014 to purchase a kiosk at Berry Springs Nature Park just 4kms from the farm. A hugely popular spot for swimming in the pristine waterholes, it has proved a great outlet for our delicious homemade ice creams which sit alongside icy cold drinks, sandwiches, local pies and a range of swimming accessories. You can even hire a pool noodle for the day! 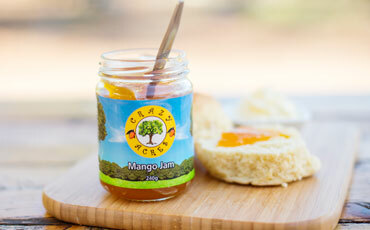 Come and visit us at the farm café and shop between May and September. The Kiosk is open at Berry Springs 7 days a week while the pools are open for swimming. [Generally between May and October]. * The natural pools at Berry Springs may be temporarily closed for swimming, particularly in the wet season (October – April) when conditions are considered unsafe. Check our facebook for Berry Springs open/close dates.